For our friends in the City of Gold, we bring you our selection of places to get ice cream in Johannesburg. For all things dreamy, creamy and frozen, this is where you need to be. Whether it’s ice cream, traditional gelato, or some healthy and delectable fro-yo – we’ve got enough to tickle your taste buds. 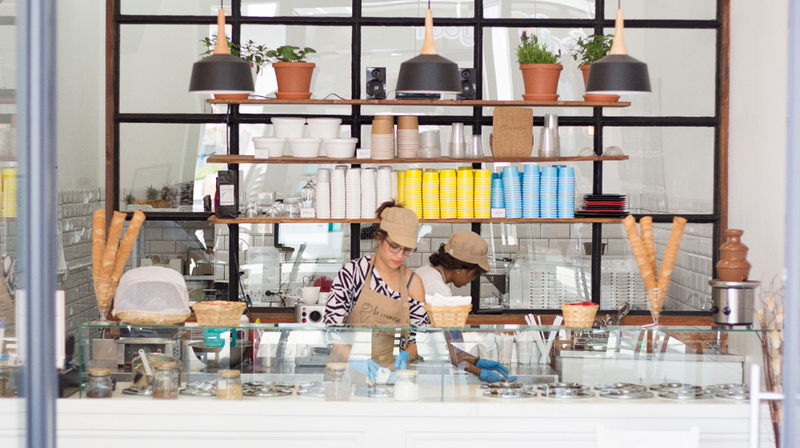 Paul’s is pretty famous in the realm of artisanal ice cream, known for their superior scoops and trendy stores, Paul’s is always a go-to fave for Jozi folk. Paul Ballen began his famous ice cream journey when he was gifted with an ice cream machine for his birthday. He went from painting his family kitchen in an explosion of ice cream ingredients to owning one of the most loved ice cream brands in the country. Paul’s features a new ‘flavour of the month’ every month, as well as an impressive range of delectable special flavours that ensure that you keep coming back. They offer kosher flavours, healthy sugar-free options like toasted chai tea, and their “Caralishous” range of vegan flavours such as peanut butter, toasted coconut and cocoa. Definitely one of the more diverse spots to get ice cream in Johannesburg. 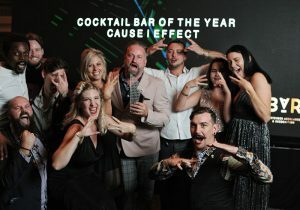 We love their: Cardamom & Candied Pistachio, White Rabbit and the Salted Caramel Praline. Location: See here for a Paul’s near you. Can’t afford a trip to Italy? La Cremosa invites you to experience a true taste of Rome. With an impressive imported skill-set from Fonte della Salute in the narrow cobbled streets of Trastevere, this spot offers only authentic homemade gelato and people are flocking from all over to get their paws on it. The trio of entrepreneurs – David Ficini, Mauro Benedetti and Sandro Tomassetti – grew up playing in David’s father’s gelateria, where their age-old traditional family recipes were born. 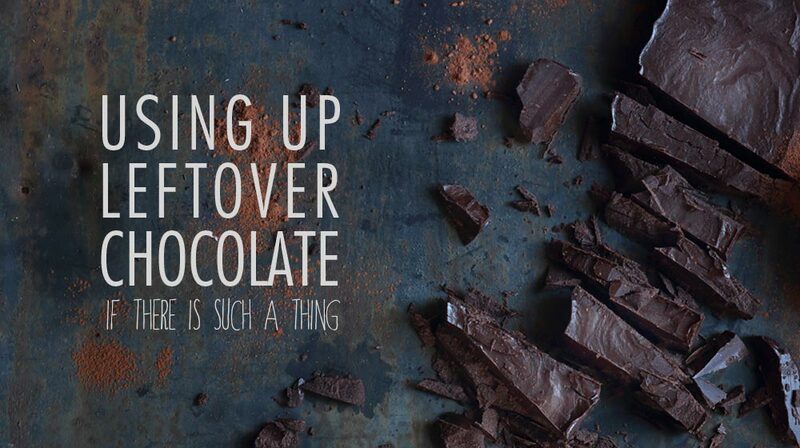 Think classic Italian flavours like Stracciatella, Bacio, and Walnut & Figs, as well as some other interesting options like Chocolate Chili & Cinnamon and Mozambican Coconut. These creations can be found in their beautiful store in the Dainfern Shopping Centre. Expect dense and decadent traditional gelato brimming-over with flavour, as well as refreshing fruity sorbets. 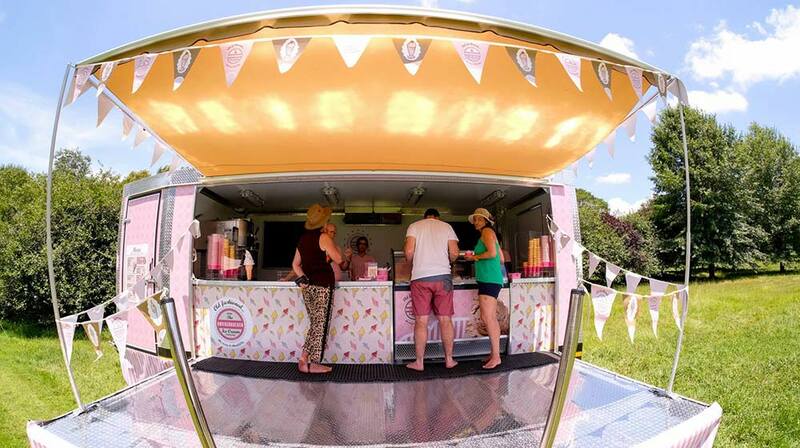 This retro pink ice cream trailer can be spotted in and around Joburg following various markets and events. What started as a retirement dream on the coast of Knysna, has now been grown by owner Andrew Hollick to one of the coolest spots to get ice cream in Johannesburg. The brand encapsulates a very old school mentality and design, think waitresses on roller blades at a diner serving traditional ice cream the way it used to be made, except instead of you driving through to them – they can drive to you! 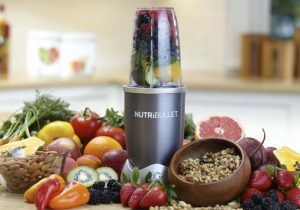 Completely mobile, Knickerbocker can travel and cater to any event, but will most certainly find them at their permanent parlour at the Stables Village Market, and their pop-up stores at Picnic in the Park and various music festivals. The team serves up gourmet handmade ice cream, as well as sorbets, fro-yo and artisanal lollies. Flavours can include Pale Ale, Hot Fudge, Pistachio and English Toffee. One of our favourite Cape Town creations has opened up in JHB. This young, colourful and vibrant store mirrors it’s equally exciting cookie and ice cream combos – que the sugar rush. Founded by sisters Shahar Ben Artzi and Or Lahat, Crumbs & Cream appeals to the young, carefree sweet-lover with their funky flavours and bright, colourful stores. Expect to be met with vibey music, colourful paint-splashed walls and patrons sitting on swing-chairs. 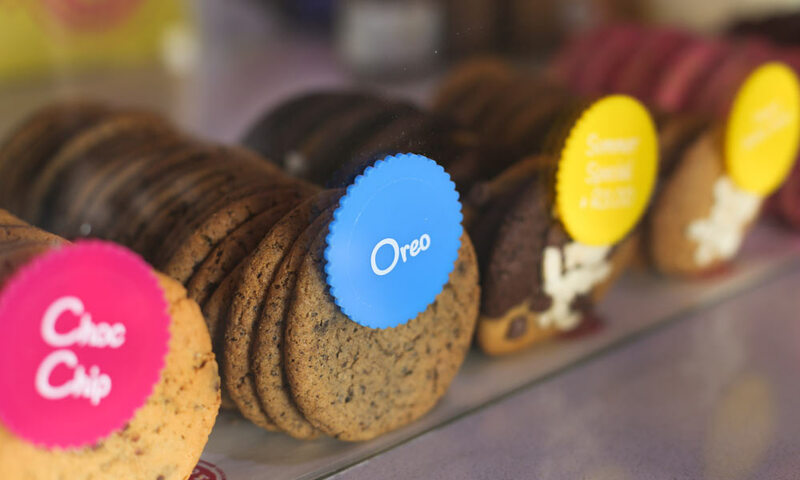 They serve up variously flavoured scoops sandwiched between cookies of your choice. You can also opt for the ice cream by itself, or one of their new decadent milkshake creations. 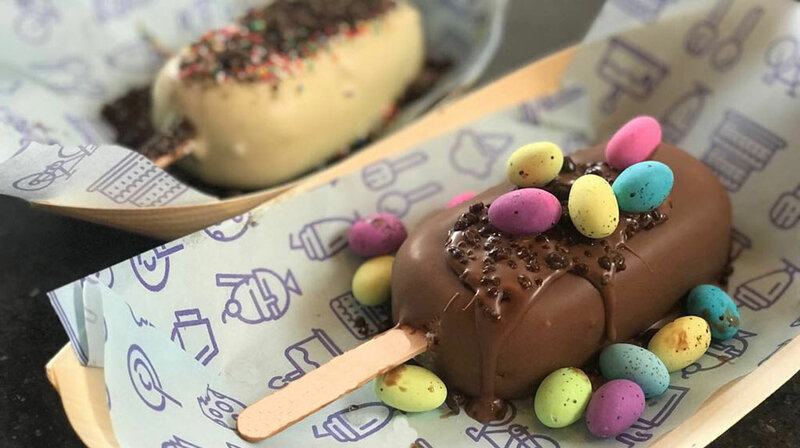 From the creators of Wakaberry Frozen Yoghurt Bar and Four15 Burrito District, we bring you Plan B Dessertery, a street-food-inspired sweet-ery filled with enough goods to make you feel like a kid again. 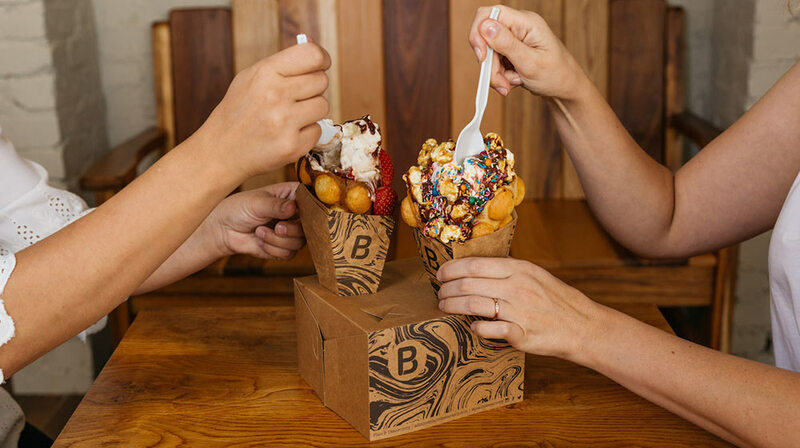 Plan B is famous for their fluffy Hong Kong inspired bubble waffles, and Mexican inspired dessert tacos and churros – que drool. The idea was conceptualised through internationally inspired street food desserts that are easy to hold and eat standing-up without utensils. The bubble waffles seem to be the most popular option, with beautifully fresh golden waffles filled with a choice of 9 fillings. The tacos and churros, however, are equally amazing – try their Banana Split Taco with banana chunks, chocolate and candied nuts. If you enjoyed our round-up of favourites places to get ice cream in Johannesburg, check out our list of ice cream spots in Cape Town too.